It's easy, when up to your eyeballs in prototype modeling, to forget how fun modeling itself can be. Sure, all the required research is fun and it's amazing when a scene comes close to replicating the real thing, but sometimes that process can be a bit overwhelming. And when your skills aren't (yet) up to the task to recreating all the prototype detail you've discovered, it can be stressful. That's the "downside" (if there really is one) to having too much information. 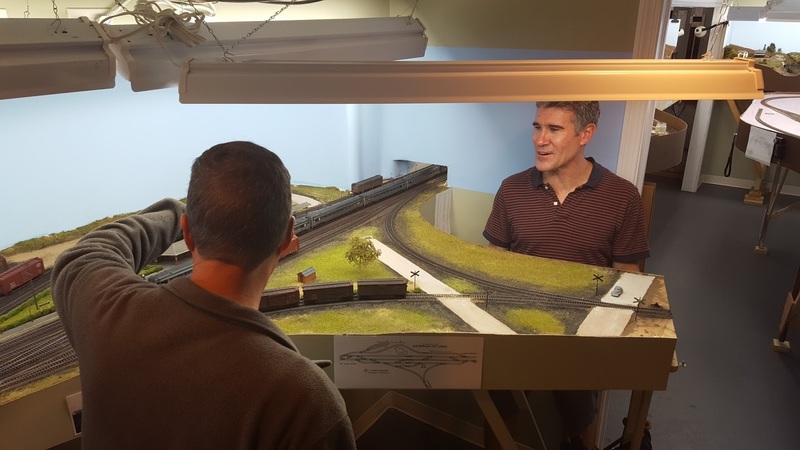 Conversely, one of the consolations of not having enough info is that you're more free to do what "looks right" - and just enjoy the modeling process itself. 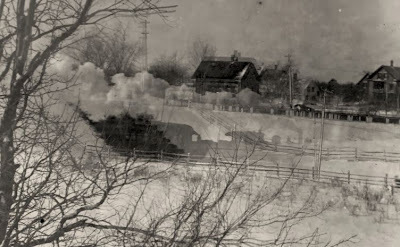 Case in point: the bridge over the Mattabessett River (aka Little River) on the East Berlin branch of the Valley Line. 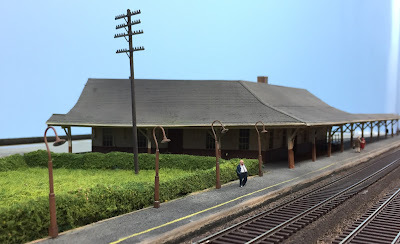 On the prototype, and on my layout, it marks the entrance to the old East Berlin station area and the final customer on the branch - Stanley Chemical Co. (paint manufacturer). That's the old freight house in the background. Ah, new kit parts - all cleaned of flash and waiting for assembly. Such promise! This was one of the trickiest steps - attaching the bracing to the sides, while keeping everything true - aided by some squares and fast-acting Tenax. Cross braces installed, which makes the whole assembly much more rigid. Then the longitudinal braces - these go under where the rails go and fit in between the cross braces. It's a little tricky to line everything up, but taking your time will yield a satisfactory result. Otherwise, don't worry - this is all obscured somewhat by the bridge track itself. The strips representing the riveted stock have to be glued onto the top of the girders - but first the tops of the girders need to be rid of any "bevel" resulting from the molding process. Taping sandpaper to glass plate and rubbing back and forth will get things nice and flat. Not totally necessary, but NWSL's Chopper is very handy for making perfectly true cuts - helpful for fitting strip ends together. If you can't get the ends to fit satisfactorily snugly, you can always fill in with a little putty. NOW it's starting to look like a bridge! I'm fitting the bridge track here to mark what ties need to be removed in order to settle it down properly. And note that I did not curve the top corners at the ends of the bridge, in keeping with the prototype. And here's the bridge track with the ties removed. And put in place. You can see where the track has to be modified in order to sit down amongst the cross pieces. The "wood" tie end bracing is styrene, but the ties themselves are delrin. 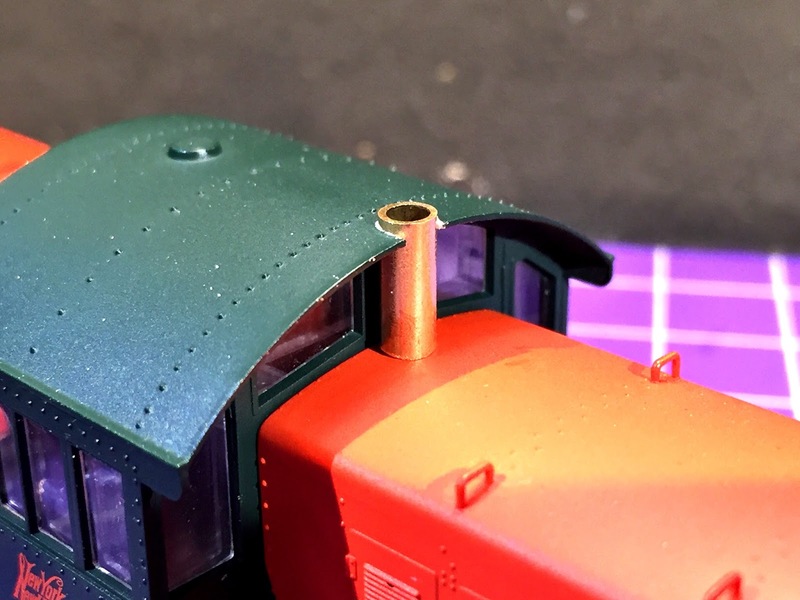 The instructions recommend Walthers Goo to attach the bracing to the ties, but I find that too messy (stringy) so used contact cement instead, applied with a microbrush. Just apply to the tie ends as above - trim to length once set. And here it is all done, except for guardrails and weathering. 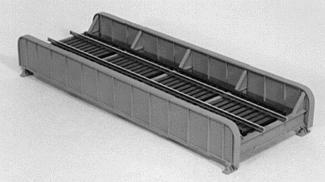 I'll use this photo of the Shailerville bridge guardrails as my guide for when I place the Berlin bridge on the layout. And here it is, lightly weathered, and temporarily placed where it'l go on the layout. After concentrating so much on ops sessions (both prep as well as fixing punch list items between sessions) and the structures/scenery for Old Saybrook (though, admittedly, mostly a support role to BillS), I'm psyched to get back to a bit of actual modeling. 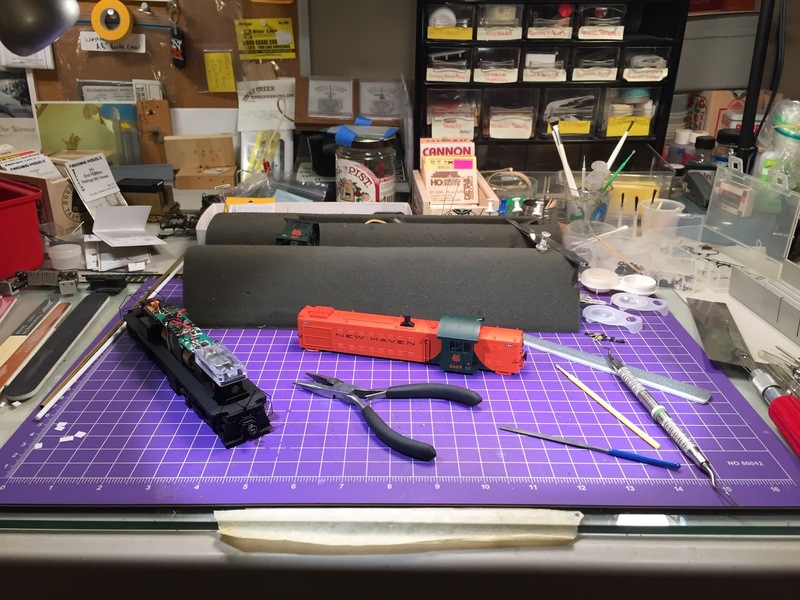 As in, at the workbench. Ah! the wonderfulness of old radio shows/music playing, a fire in the RR stove, and burning your fingers on a brass tube you're grinding down (shoulda remembered to hold it with a pair of pliers). Those are among the true joys of modeling for me. And anybody that's followed this blog for a bit know that my favorite modeling revolves around rolling stock (see what I did there?). 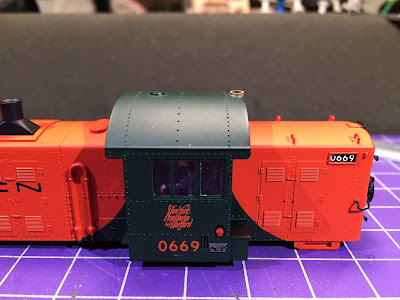 Building resin freight cars and detailing locomotives based on a specific prototype are what I most enjoy doing. Just witness my DERS-2b project as proof. I made an executive decision not to add marker lamps & MU stands as I had on the DERS-2b. Just way too much trouble for what they add. I may scratchbuild & add MU details at some point in the future, but once I discovered that the Custom Finishing part wouldn't fit as it had on the RS-2, that ended that. And don't even get me started on New Haven-only details such as the raised rear number boards, the different location of the fuel filler overflow pipe, not to mention the different locations of the fuel fillers themselves. 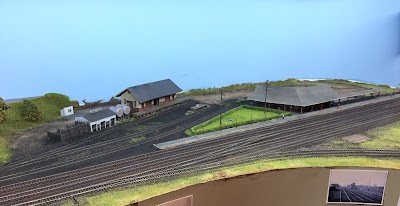 If I worried about them, this model wouldn't get done for A Very Long Time. Friend JohnK suggested that I simulate the exhaust stack going through the cab roof by fitting a 1/8" styrene tube between the hood and the roof and then adding a "washer" of material on top of the roof. That would avoid such delicate drilling. But I'm stubborn - sometimes in a bad way - and doubted that that would look right. So I started drilling with a #60 drill, centered between the end of the cab and the edge of the roof, and gradually increased the drill diameter until I got to a 1/8" drill bit. Heh - it was that last little bit that finally broke through the roof edge that I had hoped to preserve. But to my eye, I think it looks fine - and certainly shows that the stack is all one piece. Oh, and I decided to use brass tube rather than styrene so that the stack edge(?) would be thinner (and the opening/inner diameter larger). It looks much closer to the prototype - again, to my eye anyway. The biggest challenge so far (other than drilling such a precise hole) has been to get the right length. The stack has to barely protrude above the top of the roof. 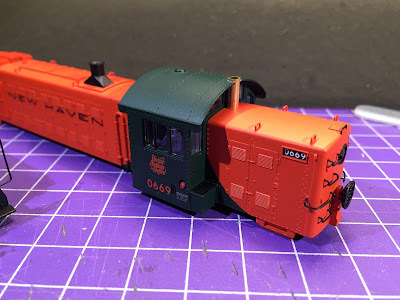 I'm using the cab vent height as a guide. You may have to click for a larger image (you can always click on an image to make it larger), but you can see here that I'm pretty close. Just a bit more filing to do. It's amazing how the addition of one little(ish) detail can really start to change the look of a stock model and make it start to look like the prototype. Just have to paint the tube - then I think it'll look just right (despite having broken through the edge of the roof). Since the Atlas model came with so many details already done, I hope the DERS-1b doesn't take as long as the DERS-2b. I may not have it ready in time for the next operating session, but I'm certainly going to try. 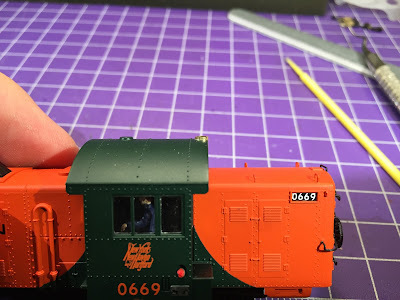 I hope you'll enjoy following along - and please chime in with any tips or suggestions you have, especially if you've detailed one of these models before! Whew - Quite a weekend! 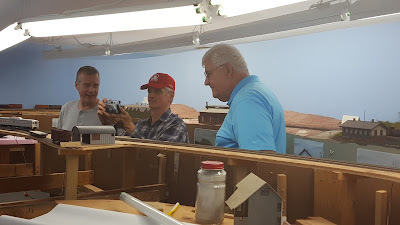 It started out Friday night with a small open house for folks coming in from out of town for the New Haven Railroad Historical & Technical Assn's Annual Reunion/Train Show on Saturday - including fellow blogger JoeS & his lovely wife, up from PA, MikeR & his missus from MA, DaveM & ReggieD, also from PA, BillC & BillL from NJ, BobA, DickO, & BillS from closer by (CT), and JimW all the way up from FL(?!). Thanks to all of them for taking the time to visit the Valley Line. 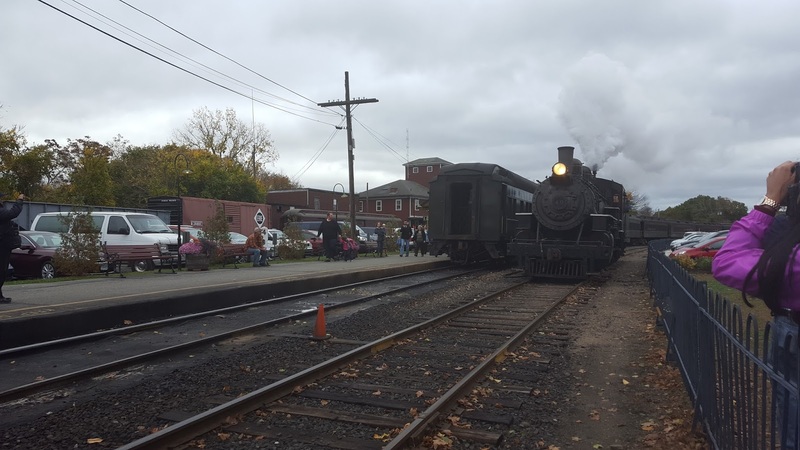 NHRHTA's show this year was at the Valley Railroad and, by all accounts, it was a resounding success. 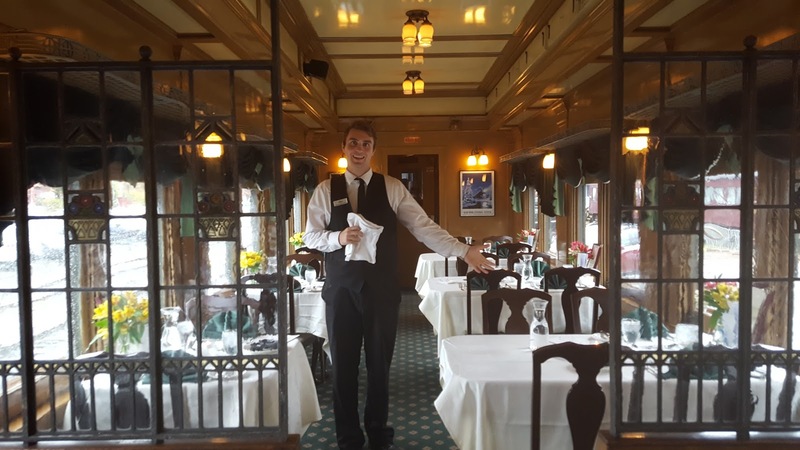 What could be better - a train show, great presentations, and not one but TWO steam-powered trains doing trips throughout the day, with a diesel powered lunch & dinner train as a bonus?! And if that wasn't enough, the entire day was capped off nicely by a "dinner in the diner" aboard the Essex Clipper. All in all, a really fun weekend. Here are some photos from the past couple of days . . .
DickO & DaveM having a convo at Old Saybrook. One of my visitors - DaveM - surprised me again by coming bearing gifts . . .
Mentioning that I needed some head-end equipment, he presented me with this great Pennsylvania RR REA refrigerator car. 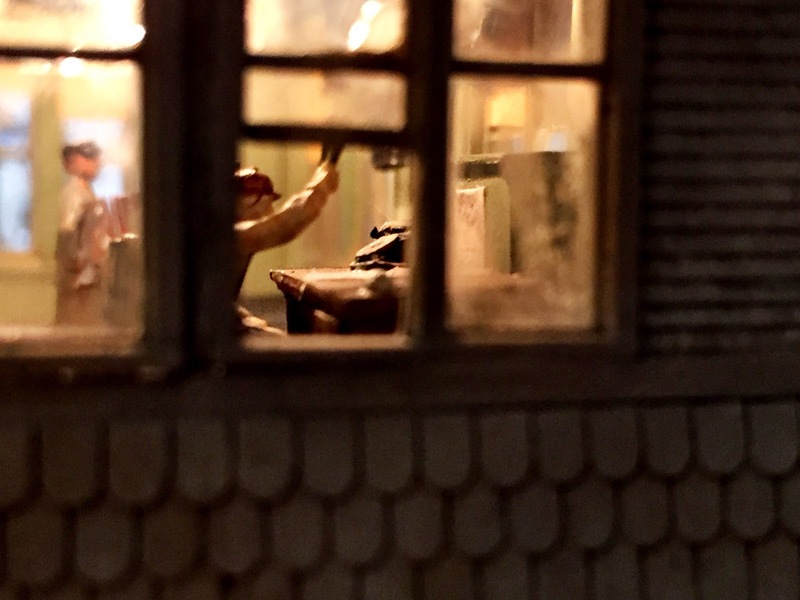 And speaking of cars, included in his bag of goodies was a car (automobile), a panel truck and - the piece de resistance - a coal dump truck lettered for Valley Coal. How cool is that?! Everything on wheels in the above photo came courtesy DaveM - Thank you again Dave! The MAIN thing is, of course, the lantern. I know it's an Adams & Westlake (heh - "Adams" - so I had to get it, right?) and it has the embossed NYNH&H on the glass to go with the markings on the top. But other than that, I don't know much about it, how old it is, etc. So if there are any lantern experts out there, please weigh in in the comments (or contact me directly via email)! 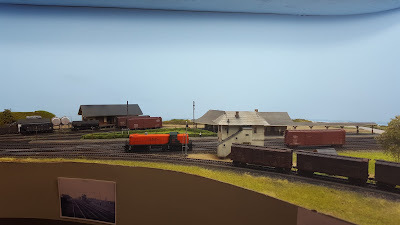 Given my evolving interest in interlocking towers due to having a model of Saybrook tower on my layout now, I got the little booklet on the left dealing with all the rules/instructions for dealing with towers. On the right is a little exam booklet for steam locomotive firemen (unfortunately, questions only - no answers(!)) And under them all is what I think is a headrest cloth from a passenger car. 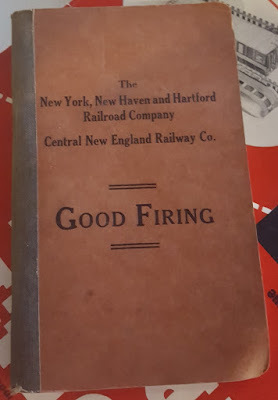 It'll make a nice addition to the railroad den (aka "train room") upstairs. As much fun as the show was, the dinner was even better. I had great table companions (BillS, his missus and daughter) and most of the car was taken up by other show attendees which made for a lot of laughs and a great night. Whether or not you're a fan of the New Haven RR, I hope you'll consider attending the NHRHTA Reunion & Train Show next year. With any luck/hope, it'll be taking place at the Valley Railroad again which guarantees - no matter what particular railroad you follow - if you're a train buff, you'll have a truly amazing day! 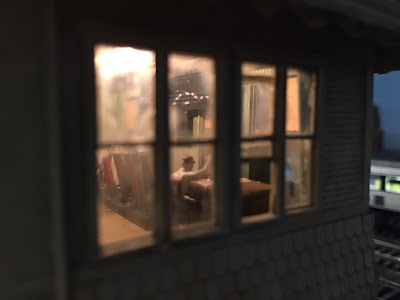 Old Saybrook, CT - HO Scale. Only the sky is 'shopped. Click to enlarge. I just realized that this past Sunday, October 16, marks exactly two years since I had a minor meltdown crisis in the hobby. I was about to give it up - I'd gotten in over my head and felt overwhelmed by the scope of the project I'd started. I thought I'd taken on way too much. This feeling of being overextended in the hobby is pretty common and is fueling the popularity of starting small(er) and building layouts that are actually achievable. Admittedly, setting realistic goals based on your available resources of time, money, and help is critical to avoiding the indigestion of biting off more than you can chew. But what if you find yourself already in the middle of a large layout project? Thankfully, I came out of the other side of that long tunnel and actually managed to expand the layout (actually, almost doubled the size), thanks to a little a lot of pushing help from my friends. But I had to go through a bit of a mental process before proceeding. If any of this sounds familiar to you, and you're considering giving up, I hope you find this (re)post encouraging. One of the best - and sometimes worst - parts of this great hobby of ours is that there are So Many Different Things To Do, so many skills to develop. Right off, carpentry, electrical, photography, artistry/scenery, and - of course - model building come to mind. But what about historical research (towns, freightcars, operations), home remodeling (if you have to finish your basement for the layout), project management (especially helpful for a large layout), and web development/computer skills (blog writing, etc)? The list is just about endless and it's Oh So Easy to find yourself going down a rabbit hole and having your otherwise-laser-focus (um, well, if you're not me) diverted from making progress on your layout. The advent of sound decoders - and the tweaking of same - has added to the ever-growing list of rabbit holes. Now....you can usually just plop a standard sound decoder into your engine, set it and forget it. All you have to do is get the right prime mover and change the address. But ESU/LokSound has raised the ante. Substantially. Their decoders allow you to upgrade the firmware using their LokProgrammer - and to make so many adjustments to the sounds (including adding your own) that it's truly mind-boggling. 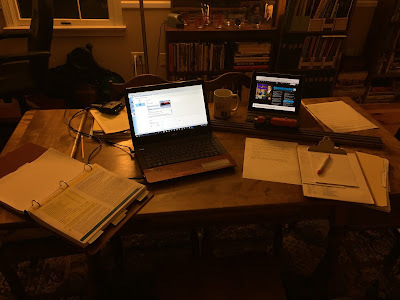 The photo above shows the extent of the rabbit hole I've gone down: ESU manuals in the 3-ring binder, LokProgrammer hardware at the back, LokProgrammer software on the laptop, paper for notetaking, 0510 on the programming track, old-time radio show on the iPad. I've been trying for a few days now to get this RS-2 running & sounding the way I want, but I'm still not quite there. The decoder install and initial programming was done (quite well, I might add) by Mike Rose Hobbies. I got a LokSound Select/direct/micro decoder, power pack (capacitor) and special "Confaloned" settings. Then ESU came out with Full Throttle and an independent brake. Good news: I can upgrade the ESU decoder to the latest Full Throttle version very easily. Bad news: I thereby lose all the cool settings I had. I did get some information on how to "backfill" the old/cool settings into the upgraded decoder, but I'll be dipped if I can get that to work successfully. Every time, the old settings just overwrite the new ones and I'm back to where I started. So, I decided to just start from scratch, learn to fish a bit, and try and set up the decoder myself. And here I am, a bunch of evenings later, and I'm still not where I want to be. I have a Tsunami in my K-1 mogul that I love - it has an independent brake on F7 and momentum/sound settings that causes the stack to really talk when you crank up the throttle, but all you hear is rod clank when you shut off. And it'll coast for miles feet until you apply the brake (which is accompanied by an audible brake squeal). That's the experience I want to replicate, albeit on a diesel (heh - no rod clank expected). I just haven't yet figured out how to do it. So, if any of you have a LokSound decoder with Full Throttle and have it set up in a way you like, I'd love to hear about your experience. And if, like me, you also have a Tsunami setup with the brake and sound settings I describe and have been able to replicate the same behavior/sound on your Full Throttle decoder, I'd be especially interested in learning how you did it. In the meantime, I'll try and claw my way back up the sides of this hole I've found myself in.